I am going to do my last Halloween tut now =) Thanks for reading. 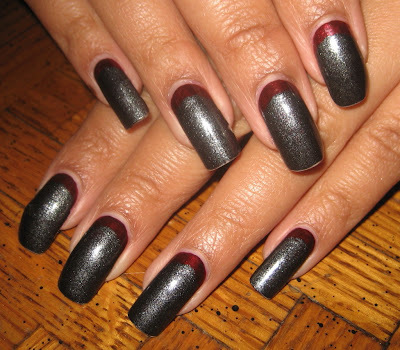 wow very creative :) i like the red base but i don't think it will look nice on my short nails. Hi Colette, It seems like we have exactly the same taste in books so I thought I would recommend a few: Anne Bishop's Black Jewels Series is probably my favourite of all time (coming in a close second is the Kushiel series). Sara Douglass is really good but is Australian so may be a bit more difficult for you to find; and Jennifer Fallon - especially the Tide Lord series but all her stuff is good. I hope that helps, Kirsten. Love this manicure. I couldn't wear it since my nails are way too short. Love Iron Butterfly. Looks fantastic. Do you know how this got it's name?